Interested in Triple Monitor Winston-E? Winston-E - Empower Higher Thinking. Winston-E is a responsive powered riser that takes the sit-stand conversation to a whole new level. 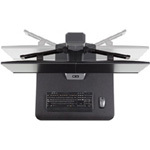 The next-generation retrofit work surface with monitor arms is engineered for ease and freedom of movement. Fully loaded, we’ve thought of every detail for Winston-E so you’re free to think about what’s important to you. 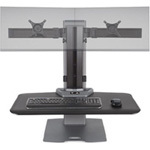 Innovative WNSTE-2 Winston-E Sit-Stand Workstation with a dual monitor mount. Freestanding base retrofits to any desk. Provides 18" of effortless height adjustment. The next-generation Winston-E sit-stand is engineered for ease and freedom of movement. Fully loaded, we've thought of every detail for Winston-E so you're free to think about what's important to you. Electric power to supercharge height adjustment with the touch of a button. Programmable control remembers your height for sit and stand. Installers can get Winston-E from box to up and running less than 20 minutes. No need to move or replace furniture. Question: I am comparing Winston-E Dual Monitor to the Kangaroo Elite Electric. Winston-E is quite a bit more expensive. What can you tell about the Winston that is superior? Also it does not have the support leg that keeps the whole workstation stable. Does Winston have a better system to not let the wobbling happen? One more question, can the monitors be adjusted separately from the tray so if they need to be in a different position from sitting to standing, can that happen? Answer: Your question is appropriate and we are happy to make the value proposition for the Winston-E Electric Dual Monitor Sit-Stand Workstation. While the Winston-E does not have the “stability” leg, its base plate weighs about 20 pounds and fully supports the column and work surface for stability. One can lean over the work surface without it tipping over even slightly. 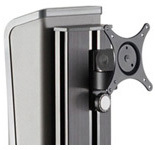 The Winston-E also has independent monitor movement and focal depth adjustment for each wing. 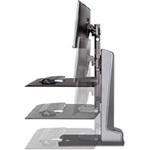 The adjustment knob allows the user to move the wing that the monitor is attached to, up and down, with ease, independent of the work surface. Most importantly, please note that with the Kangaroo the user has to put that stability leg in each time they want to raise the work surface and take it out when they want to lower it which makes the process of going from sitting to standing longer and more difficult than with the Winston-E, which raises and lowers with the touch of a button. The idea behind this convenient feature of the Winston is to make the process of switching from sitting to standing so easy that the user is encouraged to switch back and forth at regular intervals throughout the day.